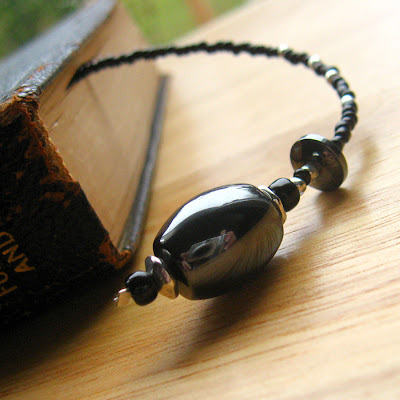 Inky magnetic hematite and shiny steel accents are combined in this understated and unique fully beaded bookmark is handmade to be perfect for books, journals, BoS and more. This beaded thong bookmarks are sure to mark your place with a sense of personal style without damaging book's pages by the commonly used corner-folding methods. I use my own bookmarks not just in books I'm reading but also in my date book and journal to make it easy to turn to the current day's log.